Anyhow, for those not in the know, it’s a computer game based in a post apocalyptic future where you have to wander and kill and collect to survive. It’s also filled with silly little things to lighten up a rather dark and unpleasant setting. One such thing is Mr Fuzzy. A rather creepy looking mascot to a now abandoned and rotting theme park. The little toys (and so many varieties) are everywhere! It’s supposed to be creepy. For those curious, I heavily modified the free pattern Basic Body by Sara Lee and until I did the face, it was actually looking really cute! No change from last week’s wool count so won’t include it this week. We also survived all four of us staying in one hotel room with just two beds for the duration of the trip (three nights, four days). Never again. Never. Same room, fine, but Inkling is really like an octopus when trying to share a bed with him! We also survived the wedding ceremony, meal and after party with no tears, tantrums, or any issues. A miracle really seeing as we were all tired and cranky! The trip was actually really fun, and I got to catch up with a lot of family, just when it comes to doing it again, I know what to do different next time. All for now, I’m tired and have so many chores to catch up on still! To be fair, all mens socks feel like that, endless, especially when your knitting the foot, however this pair in particular felt never ending! So, long story short, we picked up some Welly socks for Felix in the Christmas sales, despite being bright pink, both she and Engel love them due to the foldover cuff having kitty ears and cute cat faces…so much so it was insisted that I make Engel his own pair. Now, after merino-gate (several pairs of merino socks washed on a 60C wash, they came out so small not even a 6 month old Felix could wear them) I had swore never to knit Engel socks again. Or let him wash hand knit socks. However after three months of pestering I broke to make this pair. But I refused to go and but nice new wool, hence the rather crazy blue/yellow/green sock wool used! Also, it’s superwash, so less likely to die in the washing machine. And the pattern is chunky, so a “quick” knit. Short post this week, have a lot to get in with and a busy week scheduled next week, more revealed next post! And there will be at least two knits to show off then as well! So, after knitting the Cthulhu mittens for 3D printed Nerf parts, I was inspired to knit myself a “sensible” hat! 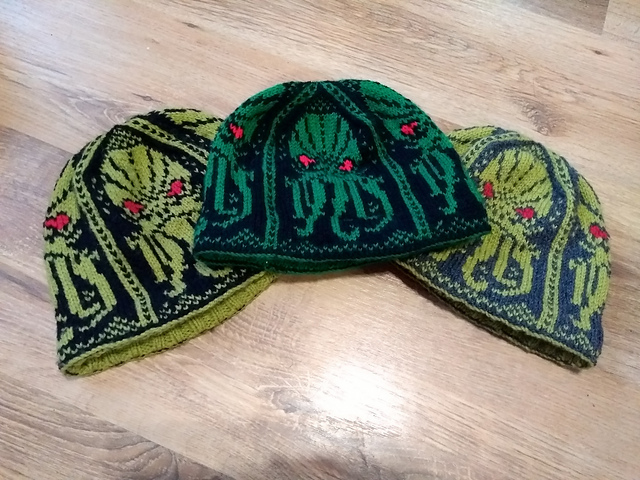 Not one, but two more Cthulhu Hats were requested! 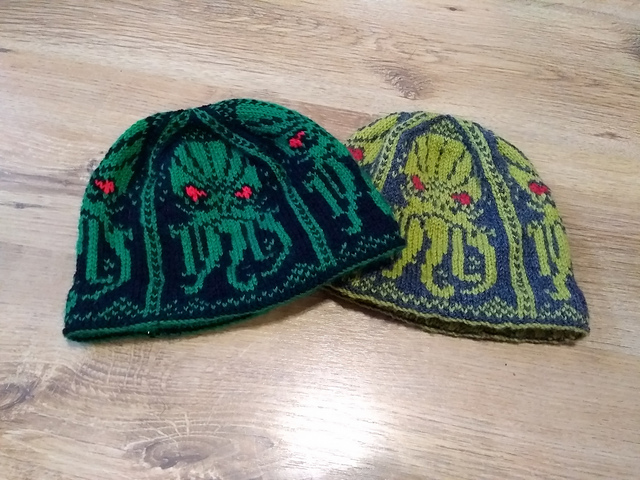 One is in the colours of the Cthulhu mittens just made, and the other in khaki green and dark grey for a more muted version. Want to see them all together? On the downside, as I was casting off the rib portion on the final hat, I snapped one of my favourite dpns…such things happen, especially when working on 3mm needles, but I was not impressed! Also, this particular item needs to be done before December! They are Inklings very own advent calendar! 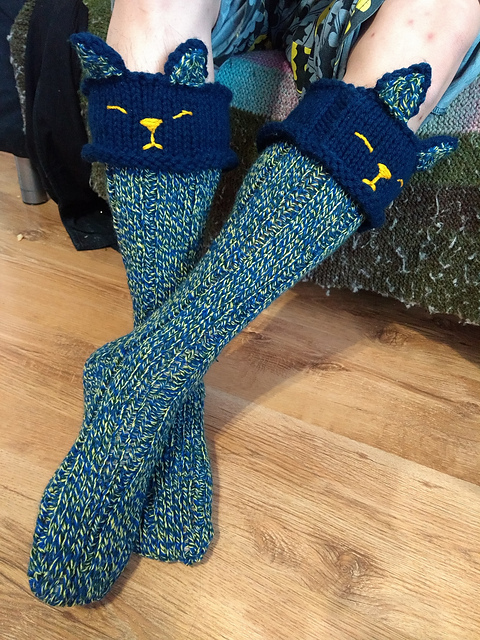 (He was rather jealous christmas just gone that he didn’t have one and Felix did…) Pattern is my go to free pattern for advent calenders – Christmas Stockings by Amanda Berry. So cute, easy and versatile! Going to have to say though, knitting Christmas things when we were having unseasonably warm weather is just wrong! I’ve based these on the free pattern Tribble by Abigail – 1870pearl, but worked in stockinette and using ruffle wool. Been a busy week at work and today was at Foamfest, Britain’s first Nerf convention – it was good, lots of ideas of what can be done to the Nerf blasters to make them more awesome, be it internal modifications or paint jobs! That’s all for now, have a good weekend everyone! Last of the washcloths (for now) and Felix chose a dragon for hers! It’s based on the free pattern Dragon by Louise Sarrazin. There’s actually a bit of a back log of knits to show at the moment, but I’m going to space them out as I know there will be weeks soon when I’m working on bigger projects and will have nothing to show you all! And yes, nose warmers are a thing. 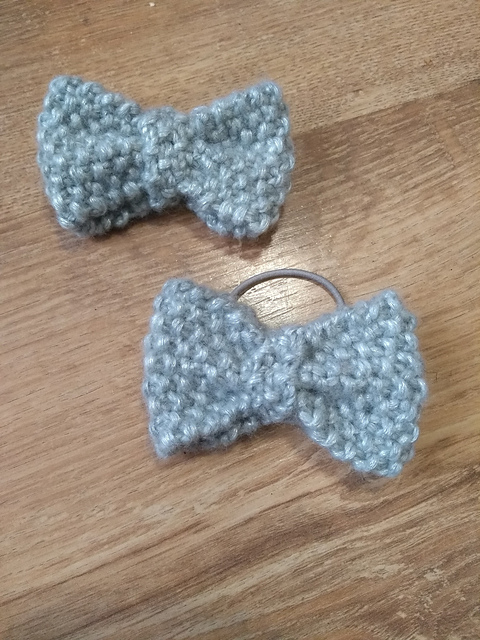 Here’s the free pattern I used: Nose Warmer by Kristi Kittelson – though I used glittery wool because, well, because my mum likes a bit of sparkle in her life! Phtang phtang Nerf parts phtang! The mittens were handed over today whilst we were meeting people for a small Nerf event, (just a bunch of loons running around a field shooting each other with Nerf blasters that’s also family friendly, so Felix and Inkling could join in) and Engel received a box of parts. In other news, we went to Chester zoo to check out the Big Cats Lego exhibit (and of course the animals) and it was awesome!!!! A quick post of a quick project! It’s a washcloth, made following the free pattern Kitty Prints Dishcloth by Louise Sarrazin. I’m in the process of updating a few of our washcloths that have been worn thin from sheer use! This one will be for Inkling, who is currently going through a ‘cat, cat, meow’ stage with his babbling, Felix has chosen something more interesting though for hers! But more on that when I’ve made it. Which is after a much larger project that’s nearly off the needles, but there’s a story to that! Which I’ll tell you about she they’re done. 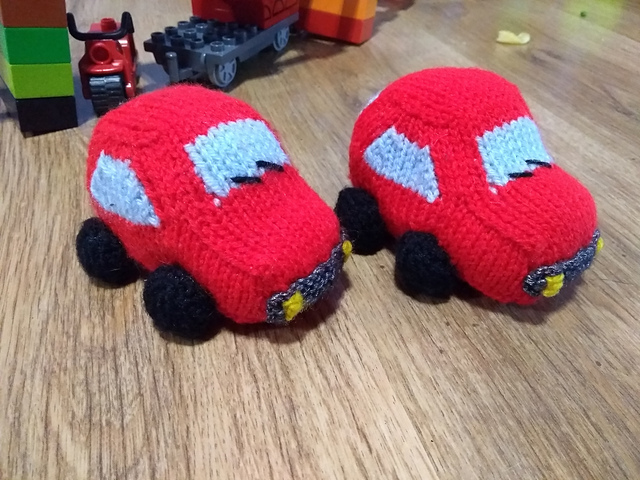 I do have one story to tell, though it’s more of a confession… You see, last week I mentioned in the wool count that I had to buy a ball of wool for a commission. Which is true. Except…it wasn’t quite the shade I wanted. It looks good, and works, but it wasn’t what I wanted in my head. I checked three shops for this wool with no luck. Then I was in town on Sunday and there it was. The exact colour I had been looking for. The exact weight I had been looking for. But only sold in packs of 10. So now my wool count is higher than I had initially started with at the beginning of the year. Oh well! Oh, and I was given four balls of wool as well for fixing a jumper for someone else. Anyhow! A friend of mine emailed me a photo of a cat wearing a crocheted Wizards hat with the comment that I should make one. I was tempted, but my kitties have access to lots of props to play with in the course of my various creations. Witch hat? That sounds more my style mummy! I hope he likes it! And his kitty!